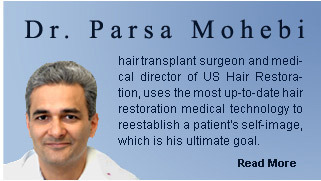 As with any surgery, there are risks involved with hair replacement surgery, primarily during the healing process. There is always a very slight chance of skin infection, which is usually easily treated. Other issues are more accurately characterized as a possible hair transplant problem, but these issues seldom qualify as major medical risks. During your consultation with a hair loss specialist, the possible side effects of a hair transplant and any potential problem following hair replacement surgery will be discussed in greater detail. One side effect that can be a hair transplant problem is numbness around the donor or recipient site. This lack of sensation is almost always temporary and should disappear within two or three months of hair replacement surgery. Although not a true medical risk, there is also a slight chance that the transplanted hair will not survive the procedure.